Click here to have a catalog mailed to you. View the NEW Online edition of our catalog. Call us toll free at 800-426-8249 to order a catalog. 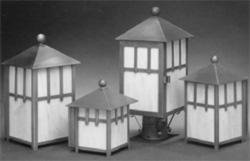 For over 20 years, J.R. Coppersmythe has provided quality handcrafted lighting. Our Signature Collection reflects the heritage of American craftsmanship and the practicality of colonial American design and ingenuity. See it in our Catalog! This line of lighting harkens back to the oil-powered street lamps of Beacon Hill and Charlestown. Their warm and universal glow brings with it sounds of cobblestones, Christmas carolers, and the passions of the Revolution. These lights get their name from the shape of their globes -- either round or oval, with a root and stem. 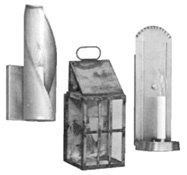 Their classic lines make them tasteful additions to any colonial, Cape Cod or coastal architecture. Rustic punched tin lighting is the perfect accent to any colonial home. Original patterns reflect the symbols of our heritage. We offer a full line of hand-crafted arts and crafts lighting in a variety of finishes and your choice of frosted or caramel glass. These pieces will warmth and style to any decor. So much weight is placed the key lighting in main areas of a home. Grand foyers and dining room chandeliers do set the tone of a house, but it's the lighting in the small nooks and passages that light the path to home. We take pride in the variety of lights we offer in smaller scale.